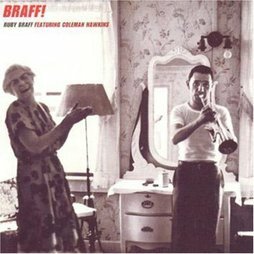 Ruby Braff was something of an anachronism emerging on to the jazz scene in the early Fifties when most young trumpet players were taking the route trod by players like Dizzy Gillespie and Clifford Brown Ruby was looking back to players of an earlier age like Louis Armstrong and Bix Beiderbecke. It was the early Fifties recordings by the Vic Dickenson Septet that brought Ruby to the attention of the record collectors, it was from these recordings that the term Mainstream jazz was derived. He was a highly inventive and lyrical player and in later years switched from trumpet to cornet which has a more mellow sound and more suited to Ruby’s style.The recordings on this album are taken from three separate sessions but are not grouped together on the album which gives variety but has you constantly checking the personnel in the notes. Possibly the most interesting tracks on the album are the ones which have Coleman Hawkins in the personnel. On Ruby’s own composition “Here’s Freddie” Ruby towers over the ensemble before Nat Pierce takes over at the piano which then develops into some fine baritone work by Ernie Caceres, Ruby returns for another bite at the cherry before Coleman Hawkins enters with a typical big toned tenor solo and it’s then the turn of some smooth trombone from Lawrence Brown. Most of this groups tracks follow much the same pattern but mention must be made of Don Elliott’s outstanding contribution on vibes. The Quartet tracks are another matter with the lack of a bass player but with Steve Jordan on guitar but then who needs a bass player with Dave McKenna at the piano and whose left hand takes care in that department. Their first track is a heartfelt reading “Stardust” by Ruby with a beautiful contrbution from Dave McKenna. The quartet’s version of “If I Had You” just moves on a lovely tempo which carries the listener along. The sextet tracks are typified by the interplay between Ruby and Don Elliott on vibes, Nat Pierce also has much to contribute to these performances. This album contains some of best of Ruby’s early recordings with some outstanding playing by the others in the star studied personnel. Highly recommended to all lovers of mainstream jazz and any lovers of swinging jazz.